Is A.J. 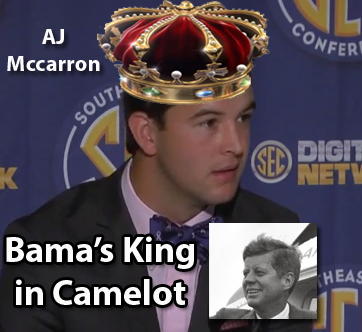 McCarron’s Tenure at Alabama Like Camelot? AJ McCarron career has been stellarAlabama. He has been a part of more national championships than he has losses as a starter (3-2). The record is undeniable that he is a proven winner. on the state of Alabama & compare it JFK's impact on our national culture. esident. Brilliant in front of the cameras, JFK exuded an air of confidence as he spoke eloquently and fluidly about the nation and the world in general. AJ McCarron, while he doesn't have the same weight of the world on his shoulders, he does carry the tag of leader for theUniversityofAlabamafootball team. His impact is not underestimated by the fans and he, like JFK, also is so cool under pressure that he has ice cubes running through his veins. While AJ McCarron is, of course, not facing anything like the Cuban missile crisis, he is a cool cucumber when games are on the line. He's a lot like Eli Manning when it comes to pressure situations. The idea of Camelot is a lot like a romantic fairy-tale that always has a happy ending. For JFK, it wasn't a happy ending but it was an honorable one. For AJ McCarron, we have yet to see ifAlabamawill reach the pinnacle of collegiate football success for a third straight time. Camelot was built on idyllic, lofty principles where King author ruled the land. AJ McCarron has a knack for being a team leader and always puts his team first. In fact, he is adored by his offensive line who he treats to a meal if he doesn't get sacked. Not desiring to be lifted up above his teammates, he is always quick to give praise to everyone else around him and take the blame when things go wrong. Another aspect of AJ McCarron's life is his love life and everyone, it seems, is interested in what's happening with him and Katherine Webb. Brent Musburger famously went on and on about the beautiful beauty queen who graduated from Auburn by saying " "Wow, you quarterbacks get all the good looking women!" Like Jackie Kennedy, Katherine Webb has in A.J. McCarron a "chick magnet" as there has been reports of him being with lingerie model ,Margaret Wood, since the national championship game. Jackie Kennedy also had her issues with JFK as he was rumored to have had affairs with beautiful women like Marilyn Monroe & Blaze Starr. Like JFK administration,Alabama has experienced a resurgence of youth who are willing to serve. Recruits like Alabama's AJ McCarron, has bought into Nick Saban's process like JFK's admonition, "Ask not what your country can do for you, but what you can do for your country"
AJ McCarron has a team first mentality and that's what I love about him. He is always focused on winning when he goes in the games. Announcers and pundits always seem to tag him with the "game manager" title title, but so what? That is exactly what he is and we are proud to have him this year, a year that he didn't really have to return back to the University of Alabama. AJ McCarron would be the first to say that we should not only thank him but also thank the other seniors for such a great ride so far on the journey through three, if not four, national titles. Come out early Saturday to the Chattanooga game and thank him and his fellow senior teammates. They have done a great deal of work to make Alabama much like Camelot... full of promise & highly successful!